Ms. Sticks creates beautiful, handmade walking sticks, talking sticks, canes and keychains by hand. She’s been a long-time part of our festival and we’re excited to have her back this year! The company began when Ms. Sticks herself lived in Cashiers, North Carolina. On her frequent hikes, she would pick up sticks from the ground and bring them home to play with. Her life changed forever once she was introduced to a wood burner. Overtime, better tools were used to speed up the design process – but it could never catch up to the creative thoughts in her mind! She continues to find ways to make her sticks more interesting by adding recycled items such as recycled leather coats for the hand grips, compasses in the tops, crystals or bubbles, even door knobs. 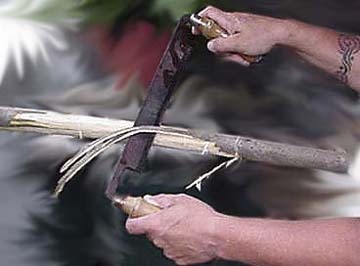 Sticks are made out of many types of wood, especially Aspen. One of Ms. Sticks’ favorite items to create is Life History Sticks. These are designed based on a person’s information, such as their birthday, memorable dates, names or nicknames, favorite sport teams or hobbies, and more. Life History Sticks are priceless pieces of work that are also functional – and they make great gifts for someone that is difficult to shop for! Ms. 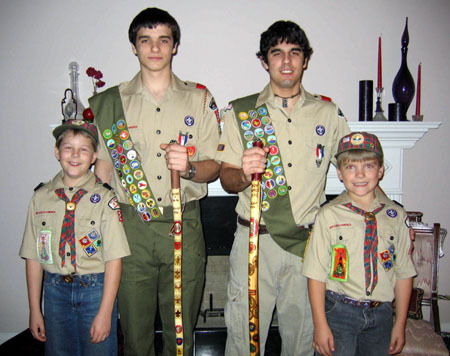 Sticks also creates Eagle Scout Sticks for boys about to earn their Eagle Scout rank. She has been licensed with Boy Scouts of America for almost 10 years now. From unique, simple designs for any age, to intricate projects that can take up to 10 hours to create, Ms. Sticks’ artwork teaches her to listen more to others. She enjoys speaking with customers to create a one of a kind, functional work of art with their ideas on it. Ms. Sticks can be found at art shows, online or on Facebook. A small budget and an empty new home fostered the birth of “The Potter & Woodsmith” – a duo of artists who, while filling their own home with handmade art, decided to turn their passion into a full time business. Sara and Steve Kozak (the couple behind the business) renovated their tiny garage into a ceramic studio to begin creating their on-of-a-kind pieces. Using reclaimed wood and ceramics, their art takes on a personality all its own. Many of their pieces begin with a stoneware clay body. Then elements of different wood types are added in to create the handles of a coffee mug or roof of a birdhouse, to name a few. The inspiration for their craft and tools of their trade can often be found right in their own backyard. Much of the wood used in their pieces comes from nearby tree trimmers or local businesses that throw pallet wood away. And while nature helps supply their craft, it also is one of their greatest muses, Sara says. In addition to their passion for ceramics and woodworking, the Kozaks love seeing how their work grows throughout the years. They welcome feedback from customers, as they recognize that each piece is a part “lifelong artistic journey” and that they will always have more to learn. The Potter & Woodsmith will be displaying their pieces at the Canandaigua Art & Music Festival, July 18-20. Their work can also be found on Etsy at their personal address: www.etsy.com/shop/potterandwoodsmith. Every person has a story, but how often is it really shared visually? In 1996, Debi Hitter, known as Ms. Sticks, hit upon a novel way to display an individual’s life stories when she was hiking in the woods of North Carolina collecting branches. A friend showed her how to do woodburning, and that opened a door into a new art form for Debi. She began crafting “Life History Sticks,” walking sticks decorated with the stories of people’s lives…the names of offspring, place born, hobbies and favorite sports teams…pictures of the sentimental details of that person’s life. Her sticks are often given as gifts for hallmark occasions such as 50th birthdays or retirment parties. But not always. She created one Life Stick for a man who had 12 children. Many of his life’s momentous occasions took place in a car… closing a bridge when his RV broke down in the middle…losing the family’s luggage off the top… getting stuck in a blizzard and having to leave Mom and the kids in the car to go for help. Imagine all this captured on a walking stick! One of Debi’s popular items is her Eagle Scout Sticks on which she engraves all the badges a young man has earned, along with other reminders of his youth. Her sticks are also used by cancer survivors to inspire healing, stories which Debi shares on her website. Each of the Life History Sticks is personally customized and typically take 2 to 3 weeks to complete, but she has a large assortment of one-of-a-kind pieces at her shows as well. Debi invites everyone to come down to the Canandaigua Art & Music Festival to be a part of the artists’ and musicians’ lives and worlds and to have a great time! What began as a way to cut costs in a middle school woodworking shop class turned into a profitable hobby for Michael Tari, entrepreneur and artisan behind Log Lamps, a woodworking company that will appear in the Canandaigua Art & Music Festival. “I taught in Sodus and we were short on funding during the 70’s, so I had the kids bring in fire wood which I taught them how to turn on the lathe to create wooden lamp bases. One seventh grader’s parents were getting divorced and his father took the lamp. Then the Grandmother took it from the father. Next thing you know, they’re in court over the lamp. I thought, ‘If they’re going to court over one of these lamps, there must be a business in this!’ ” laughed Michael. 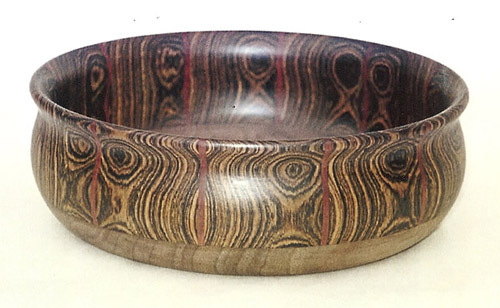 Today, in addition to the log lamps which all have 3-way outlets, he also creates beautiful waterproof bowls that need no care for life. He fashions these items out of standard woods as well as exotics such as plum, cherry, apricot, red oak and birds eye red oak. Michael sells his products primarily at festivals throughout New York State and can proudly claim having won “Best in Category” at the Naples Grape Festival in 2008. 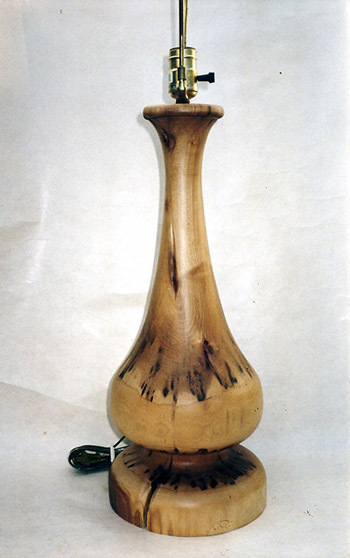 The Canandaigua Art & Music Festival looks forward to welcoming Michael Tari and Log Lamps to the show.